Spend some time Monkeying Around with your primate pals, go for the gold in Animal Olympics, take an African Adventure without leaving Como, or try on the hat of a zookeeper or gardener in Behind-the-Scenes! Como’s camps focus on developing children’s appreciation for the natural world through play and exploration, behind-the-scenes experiences, interactions with zookeepers and gardeners, and up-close encounters with plant and animal ambassadors. Qualified and enthusiastic instructors teach camps for children in preschool through eighth grade. Children are accepted into age-appropriate camps based on the grade they will be entering for the 2019-2020 school year. Join us for half or full-day adventures! Camps are half-day sessions, Monday through Friday. Combine morning and afternoon camps to create a full-day experience. A supervised lunch period is included for full-day campers. Registration Deadlines and Cancellations Registrations are taken up to 48 hours prior to the start of the camp. If a camp has not met the participant minimum one week before it is scheduled to start, it will be cancelled. You can register for two camps (morning and afternoon) in the same week within the same age group! Each camp listed is identified with a companion camp to make scheduling all-day adventures easier. Refer to the “Camp Como At-A-Glance” tab for Companion Camp Pairings. Extended Care is available one hour before Morning Camp and one hour after Afternoon Camp. Registration: The Extended Care Registration Form will be included in the Paperwork Packet sent to Parents/Guardians this Spring. People aren't the only ones who build things! Many animals are excellent engineers, too. In this camp we'll meet some of Como's animal engineers and try our hand at building nests, tunnels, dams, and even art, using nature as our guide. Go cat crazy! Discover the special adaptations wild cats use to survive, explore where cats live around the world, and see how Como's keepers care for our resident felines. Campers will make enrichment for some of Como's big cats and observe each animal's unique reaction! If you are big on bugs, then this is the camp for you! Get ready to get your hands grubby as we search for and examine worms, millipedes, spiders, butterflies, and more. Campers will learn the parts of an insect, discover how bugs grow, and meet Como's bug friends up-close. The wellbeing of Como's animals is extremely important. Learn about the valuable work zookeepers do every day including diet prep, animal training, enrichment, exhibit design, and animal first aid, and then try some of these tasks firsthand. Do you have what it takes? Lions and tigers and bears ... and more! This camp focuses on the wonderful world of mammals. Investigate what makes mammals unique, learn how mammals are trained at the zoo, and visit with a variety of Como's mammal residents, both large and small. During this wild week, campers will start in Minnesota and then embark on a journey around the world. From South America to Africa to Asia, campers will encounter amazing plants and animals and construct a wild craft to take home. Passports not necessary! Get your passport in order, it's time to take an adventure to remember! Africa is a large continent with many things to do and see. Learn about sand dunes, savannas, and rain forests. Explore Africa's many countries, and meet Como's African plants and animals. How are ostriches, giraffes, and turtles like dinosaurs? How do paleontologists know what dinosaurs were like? Investigate clues from prehistoric times as we learn about our favorite fossilized friends and meet some of Como's modern dinosaur relatives! Go bananas with your friends as we monkey around during this camp! Sure, monkeys have tails and apes don't, but there is so much more to know! Meet a primate zookeeper, observe feeding time, and participate in the Banana Olympics as we explore the world of primates. Come to ready to play outside! Create your own journey stick while spending time hiking, playing and observing plants and animals. Discover how we can use natural items like rocks, feathers, wind, and clouds as some of our toys. Learn how to? Leave no trace? as we explore the natural world around us! Bundle up because we've got a polar expedition with your name on it! Imagine traveling through the harsh, polar regions of the planet to observe polar bears as they search for seals, reindeer as they tussle on the tundra, and penguins as they swim the seas. It will be an extreme adventure! Kits, infants, calves, cubs, and hatchlings - welcome to the world of zoo babies and ultimate cuteness! Through crafts, games, and stories, we will learn how animal moms and dads care for their young and go on a special adventure to visit Como's newest arrivals. Discover your wild and creative side! Use your five senses to explore nature and art through drawing, sculpting and painting. To inspire the artist within, campers will get up close visits from Como’s plant and animal ambassadors. Do not miss out on this unique camp! Learn the basics of zookeeping and gardening through hands-on experiences. Assist Como's horticulture staff, participate in animal care, and tour behind-the-scenes. This camp focuses on the Aquatic Animal Building, Polar Bear Odyssey Exhibit and Cat Building. Explore the field of conservation in this hands-on camp. Get to know the zookeepers and horticulturists who have traveled the world and meet the species they are trying to save. Discover ways you and your friends can help endangered plants and animals and work on a photo project that will inspire people to care for Planet Earth! Join the Exhibit Design team at Como! Explore the zoo's exhibits, meet live animals, visit with zookeepers, and work to design your own model of an animal exhibit. On the final day of camp, participate in an exhibit showcase and share your creative designs with zookeepers! Flap your wings and fly on over to Como for this fantastic, fun-filled camp! We'll meet a variety of nature's best flyers, from birds to bats to bugs! Conduct flight experiments, make bird feeders, play games, and experience other fabulous flying fun. It's the closest thing to being a primate keeper! Explore the lives of primates in the wild and here at Como. Meet a primate zookeeper, participate in food preparation, design enrichment, observe ape training, and learn what you can do at home to help primates around the world. If the Olympics were held for animals, what would the events be and who would take home the gold? Join Team Como as we sprint like cheetahs, power-lift like rhinoceros beetles, and take aim like archer fish. Get ready to carry the torch to world record-setting fun! What's the difference between a reptile and an amphibian? Hop, slither, or swim over to Como to encounter the coolest cold-blooded creatures at the zoo! Campers will meet live reptiles and amphibians, discover their amazing adaptations, and play scaly and slimy games. Splash! Jump on in and get ready for a wet and wild week as we explore the world under the water. Through crafts, games, and awesome adventures, we will learn all about the plants and animals that make the ocean, lakes, and rivers their home. Do not miss out on this unique camp! Learn the basics of zoo keeping and gardening through hands-on experiences. Assist Como's horticulture staff, participate in animal care, and tour behind-the-scenes. This camp focuses on animals from Apes to Zebras and includes the Primate Building, Tropical Encounters Exhibit, and Hoofstock Building. Meet zookeepers, feed fish, and tour behind-the -scenes as you dive deep into the underwater world at Como. Find out what it is like to care for aquatic animals and their environments, both saltwater and fresh. Go fishing, collect aquatic insects, and set up an aquarium. From sting rays to sea horses, you'll see it all. Snakes smell with their tongues, butterflies taste with their feet, and mammals feel with their whiskers. Have a sensational time at Como as we play games, create art, listen to stories, meet live animals and explore the zoo and gardens with our five senses. For more information call 651-487-8272. Or, click on the “Current Programs” tab and then click “register” under the class title. Discounted rates are available for members of Como Friends. Children are accepted into age-appropriate camps based on the grade they will be entering for the 2019-2020 school year. 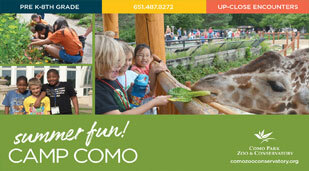 Como Park Zoo and Conservatory staff are looking forward to another exciting summer at Camp Como! Please review, complete, and return the attached forms at least one week BEFORE your child starts camp. These forms will provide us with the most up-to-date information on your child.